Can I interest anyone interested in bringing their Boss 302/351/429 to the 34 International Mustang meet in Bozeman Montana on the September long weekend of 2013? It is a yearly event and as stated in its 34th year. It started out in Lethbridge Alberta and each year it bounces back and forth between the US and Canada and keeps getting bigger and better each year. Lyle Cigler is the Chair for the event has confirmed 15 but possibly 20 (thats right, TWENTY Boss 429's to the event as well as a the Orginal Cobra Caravan (whom Lyle is friends with) will be attending barring unforseen difficulties. The event is fantastic and Bozeman is a gorgeous setting. Lyle has asked the memebers of the International to get this out on the social media so I kinda thought how often do you see several Boss 9's anywhere let alone twenty? I wonder if we couldn't make this an impromptu Boss gathering in Montana? Why Not?? The event has been hosted in the United States at Bozeman, Billings, Great Falls, Missoula, Spokane and in Canada at Lethbridge, Calgary, Edmonton, Red Deer, Saskatoon, Vancouver, Winnipeg and Regina (I hope I havent left anyone out, if so feel free to pipe up) This is as far as I know, the only event like this in the Mustang community and is going into its 34th Year. It is a great mix of old and of course the newer stuff. It doesn't have to be a Boss any Mustang will do LOL. They also have a classes for Non Mustangs too so the Torinos, Cougars, Fairlanes, Cylcones or whatever you have that is non Mustang is welcome to attend. 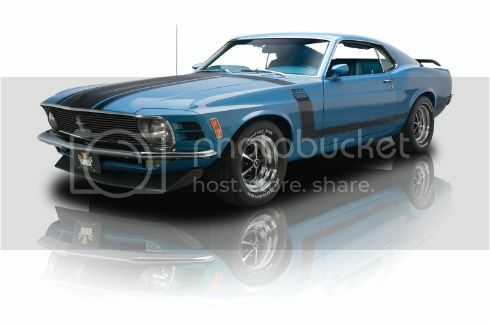 I just think it would be neat to have a lot of Boss's crawl out of the woodwork for an impromptu get together, So heres the $64000 question, I plan on taking my Boss 351 if all goes well and get it done in time, How about you guys? I will post this on the 302 and on the 429 forums as well. If you dont believe me, contact the website and ask for details. 3 hotels are booked side by side for the event at a rate of $89 per night and tghey are having the Marines reserve unit provide security for the weeken in their Fatigues! They already had a further 120 pre registrants sign up at the awards banquet that evening and that was within the hour of presenting the meets itinerary! I have included a link to their site for Pre Registration. See you in Bozeman! Looks like we will be coming from Winnipeg! A Boss 9 and myh Boss 302 if I finish in time. I'm working hard here to get my '69 back on the road and there is another '70 sitting out in the garage, ready to roll. We're in for #2 Bosses from Oregon next year! Wow thats great. Lyle is going to post on here right away so yo uknow its the real deal. Sounds like it is going to be bigger than we thought! Almost sounds like a Boss reunion! This is from Lyle posted on the 429 forum. Just talked to a family that is bringing some of the rare cars to the 34th international mustang meet 2013 wwwfordmt.com The Skinner family 1969 Black Boss 429 Holman and Moody nascar 68 1/2 428CJ Fastback 70 Boss 302, 69 Shelby GT 500 Comp Orange, 71 Boss 351 Grabber Green, 69 Mustang R code Convert. If you guys need drivers give me a call. I hope to bring my 70 Calyspo Coral Boss 429 and a friends 68 1/2 coupe. arild do you need P/s yet I have time now? We will swap out the 4:30s and head over , Montana driving is awsome just 800 miles for us. Bozeman has a great Dinosaur museum . Ed, I'll call you on Monday. Gerry, I know there will be a good showing of members from the GVMA going as well, I think they are going to make it a 2 day trip down. with all the bosses heading to the international i'll see if i can complete my hurricane sandy survivor 70 blue boss2 in time hate to miss it! at least it'll be running radials not like my old grabber orange one- polyglas tires! to spokane international yrs ago. - a very busy drive!